Li Shi (we call him "Bubba") has been here a very long time and is about 13-14 years old. He isn't the nicest dog, and will bite when the mood strikes him; yet, he can also be very sweet. He needs an experienced and knowledgeable person to adopt him. Li Shi (meaning "Lucky" - as in very lucky we found him at a very high-kill shelter before it was too late!) 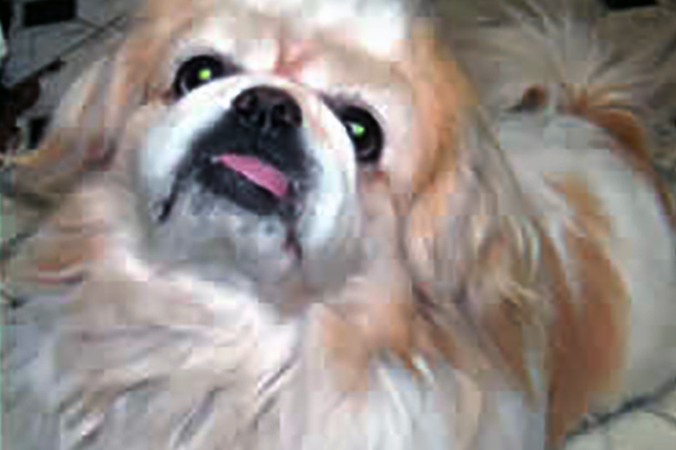 is a handsome white and tan Pekingese boy. Li Shi is crate trained, but isn't really in need of crating as his house manners are good. He is good with the other dogs and cats in his foster home. However, he is highly food aggressive and needs to be fed separately if you have other dogs. He likes taking a bath, but doesn't like his face messed around with. Li Shi is being fostered in Atlantic County, New Jersey and his asking adoption fee is $125.